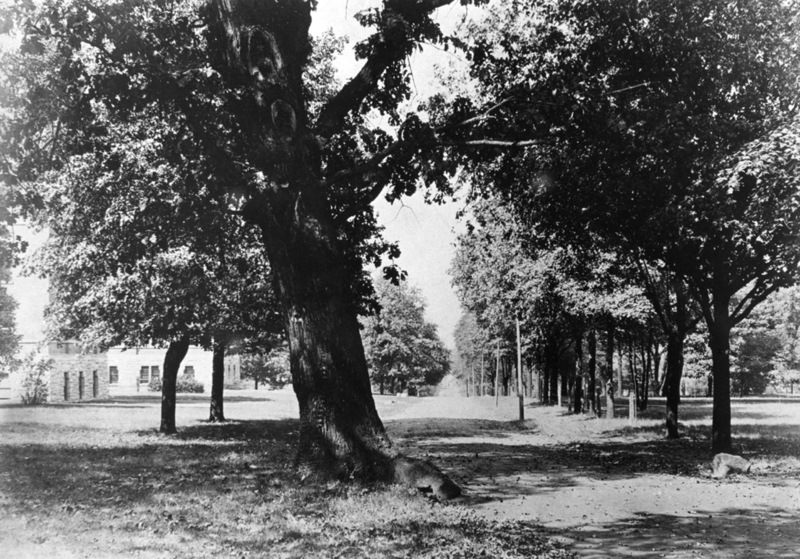 The famous Garland Oak sometime between 1900 and 1911. The original Kissam Hall is visible on the left. The view is towards West End Avenue along the former West Avenue (now a sidewalk on the east side of Alumni Lawn). Identification remarks: Vanderbilt Alumnus Magazine 2(5):131 (March 1917) states that the Garland Oak was an overcup oak. "Vanderbilt University Special Collections and University Archives photo PA.CAF.SCEN.007" If possible, link to the stable URL for this page. anonymous, 1917. The Garland Oak. Vanderbilt Alumnus Magazine 2(5):131.. Vanderbilt University, Nashville, TN, US.